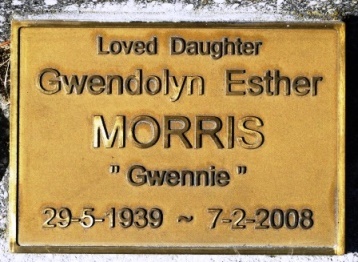 Gwendolyn Esther MORRIS was born in New Zealand on 29 May 1939. 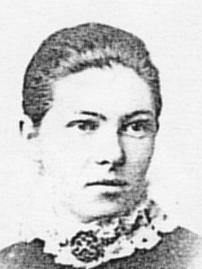 She was born deaf, due to her mother contracting German measles during pregnancy. [S576] Ashburton Cemeteries database, at http://infoservices.adc.govt.nz/Cemeteries/, Ashburton Lawn Cemetery, New Lawn Area, plot 1564, Presbyterian, aged 68. He acquired 'Winchmore' from his Uncle Hunter and later retired at Taupo before returning to the farm. 'Winchmore' later passed to his son John. [S542] Index - New Zealand BDMs online, at http://www.bdmhistoricalrecords.dia.govt.nz/, Birth Reg. No. 1907/954, and Death Reg. No. 1989/34221 gives this birthdate with incorrect year (1908). [S443] CD - NZ Marriages, CD - NZ Marriages 1836-1956 V2, NZ Registrar General's Folio 4536. [S911] Newspaper - Christchurch Press, issue of early June 1989, Deaths. [S542] Index - New Zealand BDMs online, at http://www.bdmhistoricalrecords.dia.govt.nz/, Death Reg. No. 1989/34221. [S576] Ashburton Cemeteries database, at http://infoservices.adc.govt.nz/Cemeteries/, Ashburton Lawn Cemetery, New Lawn Area, plot 2603, Presbyterian, aged 81 at time of death(? 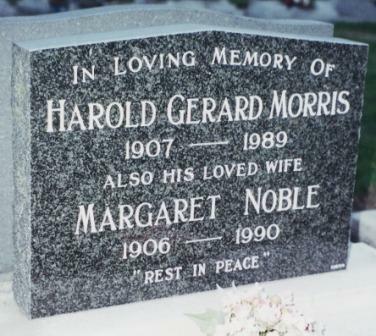 ), ashes in casket of wife MN Morris; note that this record states name incorrectly as 'Gerald' and claims a death date of 1990 instead of 1989. [S240] Will - Alexander Morris, Ayr Sheriff Court Inventories. [S612] GRO Scotland, birth/bapt record, Parish of Irvine, OPR Births/baptisms, GRO 595/00 0010 297 FR313. He farmed at 'Winchmore', near Ashburton prior to WWI, and was an active member of the Nth Canterbury Roads Board. [S612] GRO Scotland, birth/bapt record, District of Row, Statutory Births, GRO 503/00 0069. [S800] National Archives - NZ Archives (Archway), item R21377526, agency AABK, series 18805, accession W5549, box 48, record 83237 (WW1 17525 Army service record). [S542] Index - New Zealand BDMs online, at http://www.bdmhistoricalrecords.dia.govt.nz/, Death Reg. No. 1961/24423. 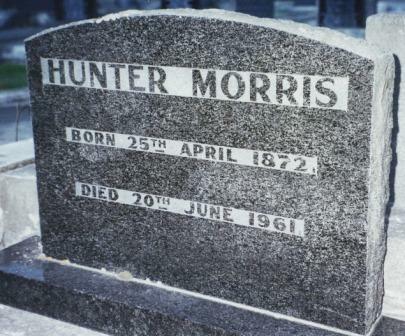 [S134] Cemetery Marker - Hunter Morris, Ashburton Lawn Cemetery, NZ. [S576] Ashburton Cemeteries database, at http://infoservices.adc.govt.nz/Cemeteries/, Ashburton Lawn Cemetery, Area 261, plot 5, Presbyterian, aged 89, farmer. [S542] Index - New Zealand BDMs online, at http://www.bdmhistoricalrecords.dia.govt.nz/, Birth Reg. No. 1865/4869. [S542] Index - New Zealand BDMs online, at http://www.bdmhistoricalrecords.dia.govt.nz/, Death Reg. No. 1945/31866, aged 80. [S612] GRO Scotland, birth/bapt record, Parish of Greenock Old (or West), OPR Births/baptisms, GRO 564/03 0050 0054. [S178] Census - 5 Apr 1891, UK census, Scottish GRO 595/00 001/00 033. [S358] Probate - Testament - Margaret Morris Archives of New Zealand, Dunedin Regional Office DAAC/9073 111 2646, Ayr Sheriff Court, SC6/44/57. [S677] Index - England High Court of Justice, England & Wales National Probate Calendar. [S1046] Index - Commissary Clerk of Edinburgh, Scottish Calendar of Confirmations, confirmation granted at Ayr 25 Sep 1894 to James Howe MORRIS, her brother; executor dative qua next of kin, as she died intestate. [S359] Probate - Testament - James Morris Archives of New Zealand, Dunedin Regional Office DAAC/9074 252 9950. [S1046] Index - Commissary Clerk of Edinburgh, Scottish Calendar of Confirmations, confirmation granted at Ayr 12 Nov 1896 to Arthur William MORRIS, Manager, Otago & Southland Investment Co, Dunedin, NZ, his brother; executor dative qua next of kin, as he died intestate. [S918] GRO Scotland, death record, District of Irvine, Statutory Deaths, GRO 595/00 0094, aged 75. [S359] Probate - Testament - James Morris Archives of New Zealand, Dunedin Regional Office DAAC/9074 252 9950, Ayr Sheriff Court, SC6/44/59. [S612] GRO Scotland, birth/bapt record, Parish of Irvine, OPR Births/baptisms, GRO 595/00 0020 021 FR359. [S189] International Genealogical Index (IGI), Batch No: C115952; Source Call No: 1041383, 0102834; Film: 6900524. [S542] Index - New Zealand BDMs online, at http://www.bdmhistoricalrecords.dia.govt.nz/, Birth Reg. No. 1860/2084. [S443] CD - NZ Marriages, CD - NZ Marriages 1836-1956 V2, NZ Registrar General's Folio 3550. [S542] Index - New Zealand BDMs online, at http://www.bdmhistoricalrecords.dia.govt.nz/, Marriage Reg. No. 1891/2644. [S542] Index - New Zealand BDMs online, at http://www.bdmhistoricalrecords.dia.govt.nz/, Death Reg. No. 1947/16731, aged 88. [S569] Waikumete Cemetery database, at http://www.waitakere.govt.nz/cnlser/cm/cemeterysearch/…, Waikumete Cemetery, Eucalyptus Glade, scattered ashes. [S542] Index - New Zealand BDMs online, at http://www.bdmhistoricalrecords.dia.govt.nz/, Death Reg. No. 1950/27597, aged 90.